Who is Buried in Israel's First Cemetery? A short walk from the Mediterranean shore, and two blocks past Ben Yehuda Street along Trumpeldor Street, is Israel's First National Cemetery, Trumpeldor Cemetery. The area has a seedy feel, decayed, overcrowded and concreted without personality like much of old Tel Aviv. There is little of the famous Bauhaus architecture to break the bleak, dirty, yellow colored, monotony of the four story walk ups. On the left side of the street is the long retaining wall of the cemetery. It opens to a gate with a curiously brightly colored sign and street number, number 19, about a third the way up the block. In the background, modern Tel Aviv looms not wanting to touch the cemetery perimeter. Perhaps it is unfair to call the Trumpeldor Cemetery Israel's first national cemetery. When the Trumpeldor cemetery was founded in 1902 it would be seven years before Tel Aviv was founded, little less the State of Israel. There had been a terrible epidemic within the city walls of the principle city in the area, Jaffa, in 1902. The Ottoman authorities would not let the Jewish dead be buried within the walls of the existing interment grounds. Shimon Rokach, a leading member of the Jaffa Jewish community, plodded along the desolate sand dunes north of the Jaffa. About a mile north of the city, he purchased ten acres of sand for a Jewish burial ground. There was nothing there at the time. The location was acceptable to the Ottomans and the local Muslim community. The cemetery was the first modern Jewish burial grounds in Palestine. It did not have the religious context as did places like Jerusalem's Mount of Olives or smaller locations such as in Safed or Tiberias. Most of the Jews being interred in Trumpeldor had not come to Palestine only to spend the last few years of their lives waiting to die in the Holy Land. Most had come to live, to bring a new life to their ancient land. They came to renew their lives, to build a new future, a positive Jewish future for their children, for themselves and all Jews. Theodor Herzl had called it Altneuland, The Old New Land. 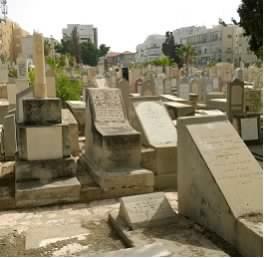 In time the cemetery filled as the city of Tel Aviv grew rapidly around it. The burial grounds took on the moniker, "The Old Cemetery", as newer internment grounds were developed. The narrow cemetery street next to the burial grounds was given a name, a famous name, Trumpeldor Street. Joseph Trumpeldor is a Zionist national hero. Russian born and with a very strong sense of identity as a Russian Jew, he volunteered and served in the Russian army during the Russo-Japanese war of 1902. Trumpeldor lost his left arm in the fighting but chose to remain with the army until it surrendered to the Japanese at Port Arthur. The Japanese imprisoned him. When peace was declared, he was released and returned to St. Petersburg where he became the most decorated Jew in the Russian military. He was awarded Russia's highest military recognition, the Cross of St. George. In 1906, he became the first Jew to be an officer in the Russian Imperial Service. While imprisoned by the Japanese, Trumpeldor edited a publication of Jewish interest. His focus turned to Zionism. He and fellow Jewish prisoners began to dream of moving to Palestine and founding a communal settlement. 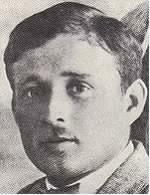 Attracting a group of fellow Russian Zionists about him, Trumpeldor immigrated to Palestine in 1911. With the outbreak of World War I, Trumpeldor refused to take Ottoman citizenship. Being a Russian and a potential enemy of the Turkish government, he was forced to flee to Egypt. The Ottoman Turks forced thousands of Palestinian Jews into exile in Egypt accusing them of being spies for the British. The Jewish refugees were in desperate states, poverty; even starvation was a reality of life for them in Egypt. Trumpeldor along with another Russian refugee from Palestine, Vladimir Jabotinsky, worked closely with the British to raise a Jewish fighting force to help the British in the war against the Turks. At first the British were reticent about creating a Jewish army, the first in 2,000 years. Jews in Britain, relishing and fearing for their newly recognized rights as Englishman, were deeply concerned about a separate, national Jewish fighting force. It was a possible threat to their British identity and security. They would be open to the accusation of dual, or worse, questionable loyalty. The meat grinder of men, which the First World War turned into, soon overcame the British reluctance to create a Jewish army. The Zion Mule Corp was founded from the Palestinian Jewish refugees. They saw gallant action in the grand vision of Winston Churchill's strategy to attack the soft underbelly of the Turkish peninsula at Gallipoli. A Christian commander was appointed to lead the men of the Zion Mule Corp, Col. John Henry Patterson. The British would not have a Jew leading a Jewish fighting force. The Gallipoli invasion was a British disaster. With great later irony, unbeknownst to the British, Col. Patterson was a Christian Zionist. He would lead a successor Jewish army for the British from Egypt directly across the Sinai Desert to fight to opposite Jerusalem, to liberate Palestine from the Turks. The British refused to give the Jewish army a Jewish distinction, an insignia, even kosher food. They refused to give them a distinct name, calling them the 38th Royal Fusiliers. They were known by all as the Jewish Legion. Patterson fought for his men tooth and claw. 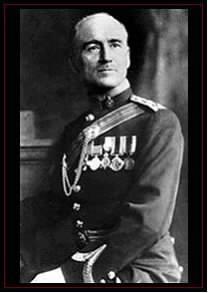 He was one of the very few British officers to have gone through World War I and was never recognized with a promotion. Patterson was discharged in 1920 but remained close to Jabotinsky. In the 1940's Jabotinsky asked Patterson to go to the United States and work for a Jewish army to fight the existential threat of Nazism. American institutional Jewry, much like British institutional Jewry earlier, fought the idea bitterly. They timidly deferred to Franklin Roosevelt's very tepid effort to specifically fight the Holocaust. Patterson became very close to another Jabotinsky supporter in America at the time, Ben Zion Netanyahu. Ben Zion and Zila Netanyahu's first son was born March 13, 1946 in New York. Ben Zion named Patterson as the infant's Godfather. They named him Yonathan, Yonni, in honor of Patterson. Yonni Netanyahu was the commander of the famed Entebbe Airport rescue of hijacked Jews by Arab terrorists, on the 4th of July, 1976. Tragically, he was also the only casualty. Patterson died in Los Angeles in 1947. His last request unfulfilled, to be buried with his men of the Jewish Legion in Israel. His last request is being considered for fulfillment as an act of honor and justice by the government of Israel under Prime Minister Benjamin Netanyahu. Yonni's younger brother. 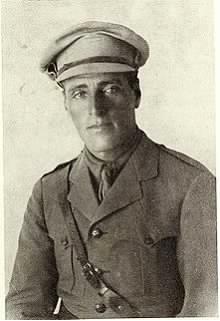 Trumpeldor served under Patterson as an officer in the Gallipoli campaign. He was wounded in the shoulder. Trumpeldor returned to Russia before he could enlist once again for the Jewish Legion. 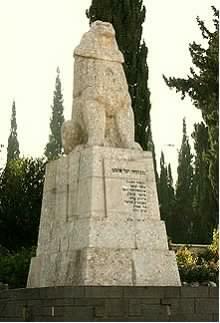 Trumpeldor returned to Palestine in 1918 with a group of Russian Jewish youth willing to settle the land and to fight, to defend themselves, if necessary. March 1920, the 11th day of the Hebrew month of Adar, hundreds of Shiites from the Southern Lebanese village of Jabal Amil gathered menacingly outside the Jewish farming village of Tel Hai. The Arabs, in the loosely defined borders between Mandate British and French Palestine, were frequently engaged in banditry posing as quasi politics. The Jews attempted to remain neutral in the French-British struggle. But the Arabs were intent on searching the Jewish settlement. A chaotic, threatening situation arose. An alarm shot was fired by a Jewish farmer alerting Jewish Hashomer (the Guards) reinforcements to come quickly. Trumpeldor arrived quickly, leading ten men from nearby Kfar Giladi. A fire fight broke out with the Arabs. Trumpeldor was shot in the hand and the stomach. Eight Jews, including Trumpeldor, and five Arabs died in the lopsided battle. After his death, Trumpeldor became a hero of Jewish self-defense. It was reported that as he lay dying Trumpeldor's last words were to the American physician, George Gerry who attended him, "Never mind, it is good to die for our country." If Trumpeldor said the words or not, the words were useful, inspiringly useful, to both the left and right wings of Zionist political ideology. The Trumpeldor Cemetery, interred with so many of the founding ideologists of Zionism, and leaders of the Yeshuv, was appropriately renamed. It was longer, "The Old Cemetery". Cemeteries are presumed private spaces for the interment of the loved or even the unloved. They are in reality, public spaces, freely and intentionally accessible to the mourners as well as to the culturally and historically curious. The Trumpeldor cemetery is both. It is intentionally both. 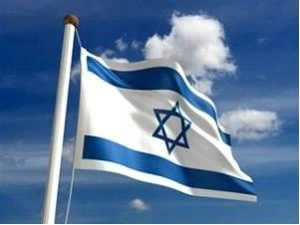 It is intended for both private, personal remembrances and for public Zionist historical messaging. Within the walls of the Trumpeldor Cemetery rest nearly 5,000 people. Each with their own special story that said they had once lived, loved, laughed, cried or had good lives or unhappy lives. Some lived bravely and some died alone and tragically. They all rest in common quietude, undisturbed except by the awkwardly moving feet of visitors trying very hard to do the impossible. The extremely overcrowded cemetery, one grave jutted up against another, hardly an inch separating resting places of men or women, an effort to create failed footpaths through the impenetrable labyrinth of stones decayed into broken tiled access long failed. Visiting the cemetery, trying to find specific gravesites requires sturdy shoes and even sturdier ankles. A short prayer of forgiveness is asked because of the inability of unintentionally, and then by necessity intentionally, treading upon a long forgotten grave. 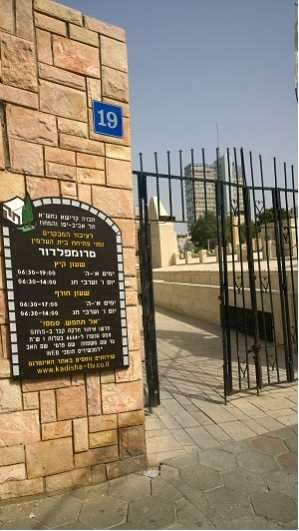 Access through the newly restored cemetery gate at number 19 Trumpeldor is even wheelchair friendly, a major accomplishment for Israel long known for inhospitality to disabled access. It was not until relatively recently that parking laws in Israel were severely modified making parking in a disabled space a major fine. Before it had been a minor fine and many Israelis, starved for a parking spot for their car, took them with abandoned care for the disabled. That in itself is an irony in a country that has fought so many wars, suffered from so many civilian terrorist attacks and maimings, to be so insensitive to the needs of the disabled. The heavy fine did the trick. Parking spaces, frequently poorly placed, are available. Immediately through the gateway is an enormous single mass internment gravesite containing the Jewish victims of the 1921 Arab riots. Forty seven Jews were murdered, and one hundred and forty six injured. An innocent victim of the Arab riots was Yossef Haim Brenner, one of the early fathers of Modern Hebrew literature. Brenner was living in a rented room on a dairy farm far from Jaffa when the free ranging Arab rioters searched for Jews. He is buried in the mass grave. His name is simply inscribed on the stone amongst the many others. Tensions between Arabs, Christians and Jews had been high. It was not a new problem. It existed wherever large population changes from immigrants displaced existing cultural norms. What was unique, and a pattern that first occurred in the Nebi Musa Riots in Jerusalem in 1920, again in the 1929 Arab rioting and again in 1935-36 Arab rioting, was that ostensibly peaceful Arab neighbors turned on their Jewish neighbors. Some Arab police in the employ of the British Mandatory government joined in the murders. Jews and the police did fight back. Forty eight Arabs were killed and seventy three wounded in the fighting. Murder and revenge killings occurred afterwards. Accused perpetrators were brought to trial on both sides with no significant results. Trust between the Jews and the British continued to disintegrate. The British Mandatory government did not regard Jewish self-defense positively. The large plaza area in front of the 1921 Jaffa victim's graves, large by Israeli standards, cuts directly into the lower third, and better maintained part of the cemetery. It does not reach all the way across but is designed to give access to the main tourist attractions  the gravesites of the "great" of Zionist and Tel Aviv history. A pathway, well maintained, leads down past a few rows of graves lined thickly with tombstones towards the bottom of the cemetery. A heavy mausoleum, architecturally unbalanced by a large laid back grave and impressive wall memorial flanks the right side of the mausoleum. The left side, a tall pinkish colored obelisk flanks the left. The mausoleum is for Max Nordau. He was a physician, a world renowned writer and literati. Nordau was a contradiction in life, as many Zionist leaders were. He carried on a torrid affair with a notorious anti-Semite and married the non-Jewish wife of a deceased close personal friend. Max Nordau was the co-founder of the World Zionist Organization with Theodor Herzl. For some historians, Nordau was the intellectual visionary of the meaning of Zionism. Anti-Semitism was a destructive disease that only self-affirmation, legitimization through Zionism could cure. Herzl proposed but it was Nordau who understood how to implement the nascent Zionist movement. Herzl got the credit. Nordau bucked the Zionist establishment and got shunted aside as better forgotten. Nordau died impoverished in Paris. His remains were reinterred in Tel Aviv. His mausoleum says simply Max Nordau. 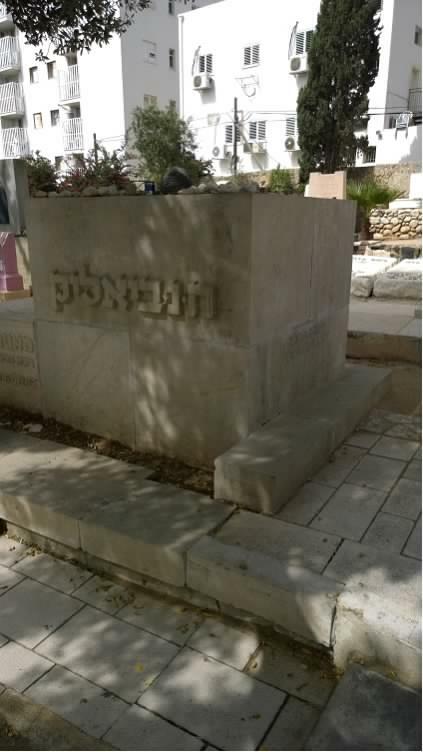 To the right of Nordau is the gravesite of Meir Dizengoff, physically and symbolically tied to Nordau's. Dizengoff was a founding father, mayor and lifelong visionary promoter of Tel Aviv. He has a main street named after him. It runs through the heart of Tel Aviv. Nordau played a delicate juggling act when the Ottomans ruled Palestine during World War I. Thousands of Jews from Tel Aviv and across Palestine had been banished. The Turks saw them as potential enemies. Dizengoff had to figure how to be the middle man, placating the Turks and getting supplies to the Jewish supplicants in Egypt. He was not above politics and chose sides. In a particularly ugly and tragic story, he refused to help funnel bribe money to possibly save the life of Yosef Lishansky who was a British spy associated with the NILI group. Lishansky was the member of a competing and more militant Zionist para-military group that Dizengoff did not approve of. Lishansky was captured by the Turks. Even with money given to Dizengoff by NILI to help Lishanksy, Dizengoff refused to help. Lishansky was hung in Damascus. He was 27. Fifty years later, after the Six Day War, in 1967, evidence finally emerged clearing Lishanksy's reputation of the false statements and innuendo attached to him in 1917. His heroism and sacrifice were finally recognized. His body was exhumed and buried on Mt. 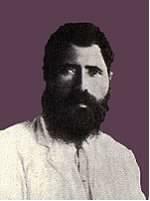 Herzl. Dizengoff was the first mayor of Tel Aviv and remained mayor until his death in 1936. He was loved and mourned by many. Until the car became a ubiquitous necessity of urban Tel Aviv life and suburban sprawl kicked in mimicking America with traffic congestion and smog, Tel Aviv was city center focused. A popular form of evening recreation was to go Dizengoffing, wandering the downtown restaurants, night clubs and "shmying" through the stores along one of the biggest streets in Tel Aviv, Dizengoff Street. Dizengoff's house became a museum after his death as with his wishes. It was Dizengoff's house, May 1948, that David Ben Gurion proclaimed the birth of the modern State of Israel. To the left of Nordau is the resting place of Ahad Ha'Am. He is buried under his roughly translated pen name, one of the people. His real name was Asher Tzvi Hersh Ginsberg. Born in Russia, a child of a very Hassidic family, he was early on influenced by the pre-Herzlian Hovevei Zion movement. An intellectual, he rejected the physical aspects of Zionism instead seeking to find a synthesis of Cultural Zionism with the emergence of modern European culture. He rejected Theodor Herzl's approach for political Zionism as impractical and worked to forward the idea of Jewish settlement in Palestine as a cultural center for world Jewish revival. His ideas, as a pre-State Zionist, were very influential guiding some of the early thoughts of Haim Weizmann, and the "poet laureate" of Zionism, Chaim Nahman Bialek. Ginsberg had a role in the negotiations that led up to the Balfour Declaration. A key change of wording in the Balfour Declaration modified the original intent of the Declaration to an establishment of a Jewish home in Palestine. The change, not directly caused by Ginsberg but by Edwin Montagu, an assimilated, anti-Zionist Jewish Cabinet minister in the Lloyd George administration, has been a core factor in the Arab-Israeli conflict ever since. Ginsberg visited Palestine many times during his life. He was very critical of Arab-Jewish relations and Jewish unwillingness to work more harmoniously with the indigenous population. Ginsberg, like many early Zionists, had a difficult time envisioning an independent Jewish state. Though having been raised in a very orthodox, religious home, he rejected Jewish religious orthodoxy because of its rigidity. He was not waiting for the Messiah to come and establish the Zionist vision of a return and a home. He just did not think it possible. He did think a Jewish cultural center, from which a reinvigorated Judaism would spread and help rejuvenate moribund Jewish life in the world of Galut, possible, even preferable. Differences between a home and a cultural center are considerable. Post Holocaust Israel has and is doing what Ginsberg envisioned but for different reasons. Ginsberg first visited Palestine in 1891, long before Herzl even thought of the Jewish State. Ginsberg did not move to Palestine until 1922. He died five years later and was buried in the Trumpeldor cemetery. 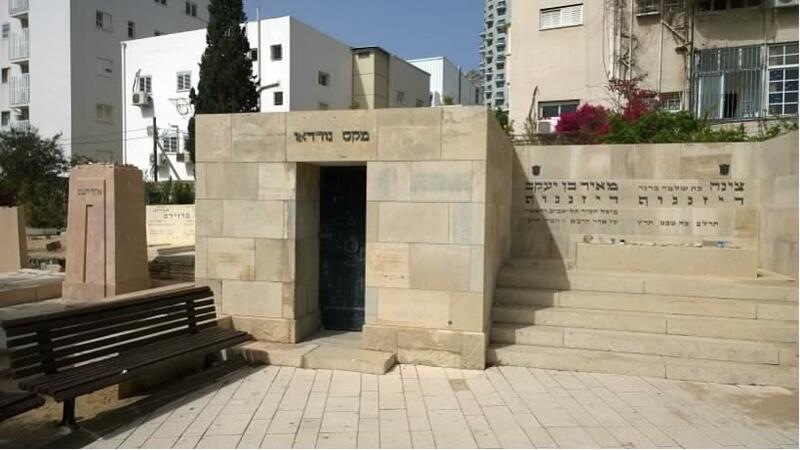 In front of the Nordau Mausoleum is the gravesite of Chaim Arlosoroff, a Zionist leader murdered by an unknown assailant along the seashore of Tel Aviv one night while he strolled with his wife in 1933. The murder shocked the Zionist movement worldwide. Conspiratorialists claim Arlosoroff was murdered by right wing extremists. Others claim he was murdered by the Nazi leader Goebbels for having had an affair with his wife. A court trial of a Jewish right winger for the murder was dismissed. The murder has never been solved. Fresh stones from visitors line the grave of Arlosoroff. Next to Arlosoroff is Hayyim Nahman Bialik. Deeply influenced by Ahad Ha'Am cultural vision of the Jewish homeland rebirth, he has long been viewed as the poet of the Zionist Vision. His poetry is deeply infused by lamentation for the degenerated Jewish nation. The degeneration was caused by exile and anti-Semitism. Similar in understanding to Max Nordau, Bialik understood that Zionism was the medicine for the sickness, the path, as Nordau would prescribe, from degeneration to regeneration. Bialik, like Ahad Ha'Am, could not envision an independent Jewish State. An independent Jewish state was beyond the thinking of the possible for many of the early Zionist thinkers. They could not be faulted entirely. It had been nearly 2,000 years since a Jewish state had existed. Things were looking better but only the most radical, the most willing of the Zionists who would free their dreams from the anchors of history, leaders like Theodor Herzl, could see otherwise. Bialik moved to Palestine in 1924. He died ten years later in Tel Aviv and was buried in Trumpeldor. 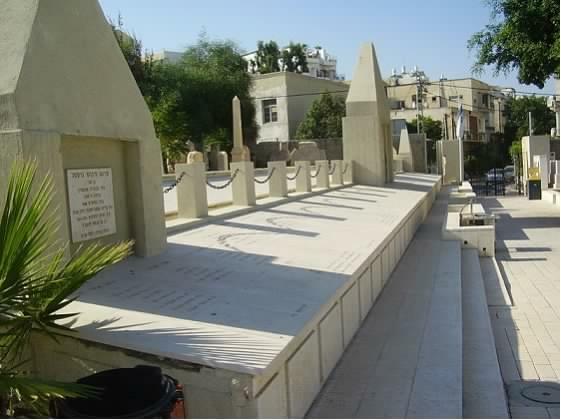 Trumpeldor cemetery is a pantheon of who was who in Zionist history. To walk among the stones, you walk among history. You touch meaning and belief. You touch the past and the present at the same time. The cynic who said that cemeteries were full of replaceable people was wrong. Doctors, Lawyers, writers, teachers, leaders, founding fathers, a signer of the Israeli Declaration of Independence, judges, artists, singers, soldiers, poets, even the Second Prime Minister of Israel, Moshe Sharett, people from all over the high of pre-State Palestinian and modern Israeli society are buried in Trumpeldor. 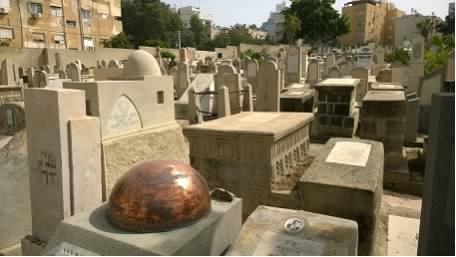 Officially the Trumpeldor Cemetery was believed filled to capacity in the 1930's. Only those individuals or families who have had plots can hope to have final rest in Israel's first national cemetery. Trumpeldor is the premier place to be in Israel next to Mt. Herzl. Trumpeldor is not closed. If an Israeli is influential enough, Ephraim Kishon, popular enough, singers Arik Einstein, Shoshana Damari, rich enough such as the mega- Billionaire Sammy Ofer, legitimately, and properly, space can be found. A Trumpeldor journey into the history of Israel would not, probably could not, be possible if it were not for the grave of a very obscure British soldier buried alone, without family or visitors in Trumpeldor. Nahum Gelman, Private, 38th Royal Fusiliers, service number J/4533, is buried in the South-East corner, the eleventh row down from the eastern wall, the fifth grave from the Southern wall. Born in Kiev, he was the son of Braha Gelman. March 30, 1920, he was 28 when he finally died from injuries sustained liberating Palestine from the Turks. He is the only member of the famous Jewish Legion buried in Trumpeldor. He died so a free Israel, with all her beauty and not so beautiful pimples, could live today. Judith Rice is an associate member of the Jewish American Society for Historic Preservation.